Men’s retro grey leather trainers from Asics. 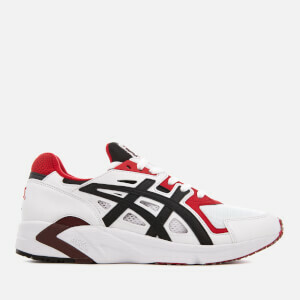 Inspired by an original Asics design from the ‘90s, the ‘Gel-Diablo’ sneakers are designed with angular lines, signature tiger side stripes and perforated detail throughout. The comfortable trainers sit on a white rubber sole with Asics’ GEL technology for a cushioned feel and a textured outsole for added traction. Complete with signature logos on the tongue and heel and GEL branding on the midsole.